Users can see holidays of their country ONLY. They cannot view other countries holidays. Step 1: Click on drop-down -> Select -> Click on option in main toolbar. Step 2: Set the date by using icon, which is at the end of “Date” field. Set country and reason for the holiday in below “New Holiday” screen. Step 3: Click on “Advanced Details” option in “New Holiday” window. This is optional feature comes with holidays and can be add the “Type” either Annual or Weekly or “None”. Default “Advance Details” option will be collapsed in “New Holiday” window. To select [Holiday Type] & [To Date], user need to click on Advance Details” option. Step 4: To change the [To date], click on the calendar icon at the end of the field. Step 5: Click on button to save the holiday or click on button to close the window. Users can view holidays using option in the main toolbar. Using this option, users can view holidays according to Month/ Year/ All. 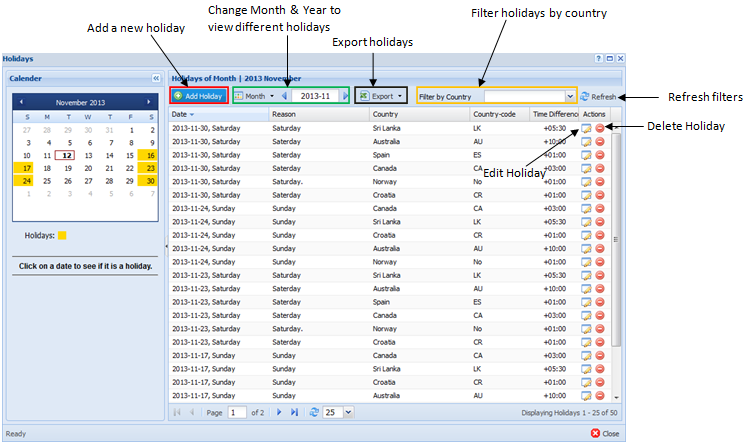 Users can sort data according to the column title by clicking on the column header. Step 1: Click on drop-down -> Select -> Click on icon to select the view option. Step 2: Select the view option either as by Month/ Year/ All. Default view option is by “Month”. For year view there are two navigation keys to help the user. Left arrow change the view to leaves of previous years, and right arrow change the view to leaves of next year’s according to the year displayed between navigation arrow keys. 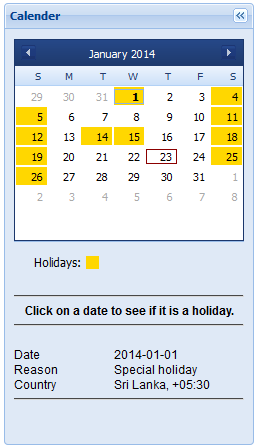 Users can use the “Calendar” panel to click on date to check whether it’s a holiday or not. 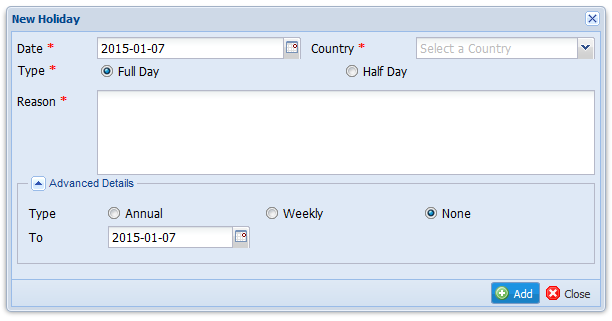 If the clicked date is a holiday, it will display the selected date, “Reason” and valid “Country”. Step 2: Select the country from the drop-down. Step 1: Click on drop-down -> Select -> Click on in the action column that you wish to change. Step 2: Change the relevant fields in the below “Update Holiday” screen. Step 3: Click on button to save the changes and click on button to close the window. Step 1: Click on drop-down -> Select -> Click on in the action column that you wish to delete. Step 2: Click on “Yes” button to confirm the operation in the below “Delete confirmation” pop-up box.